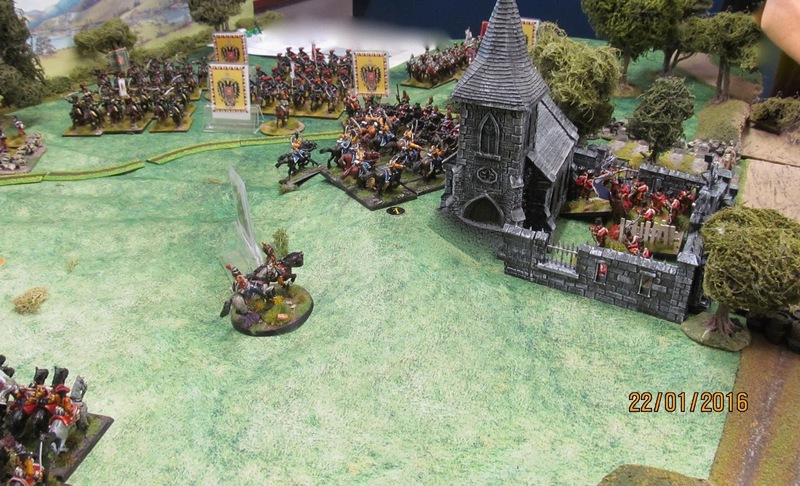 Friday's game was our second refight of Kolin within a year, this time using our new favourite rules of the moment, Honours of War, rather than Black Powder. 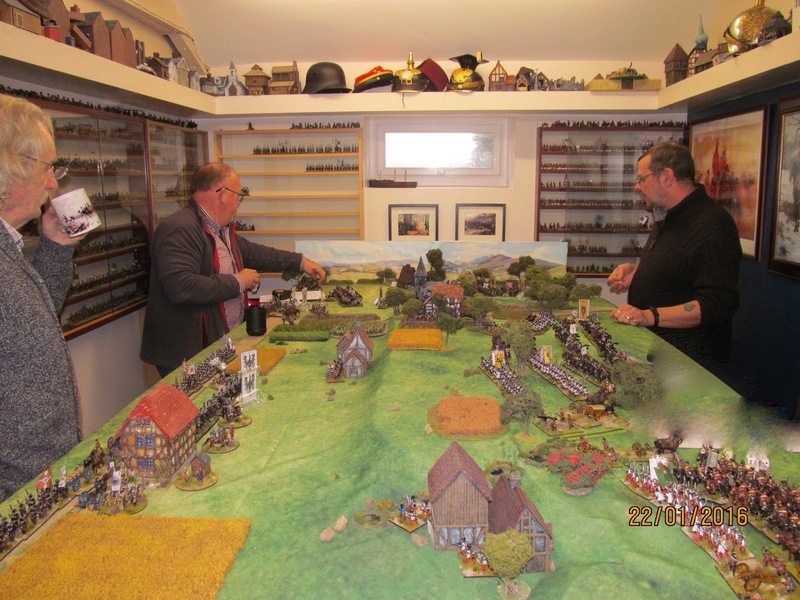 Robbie, John, Paul and myself were joined by Graham from Cran Tara Miniatures. 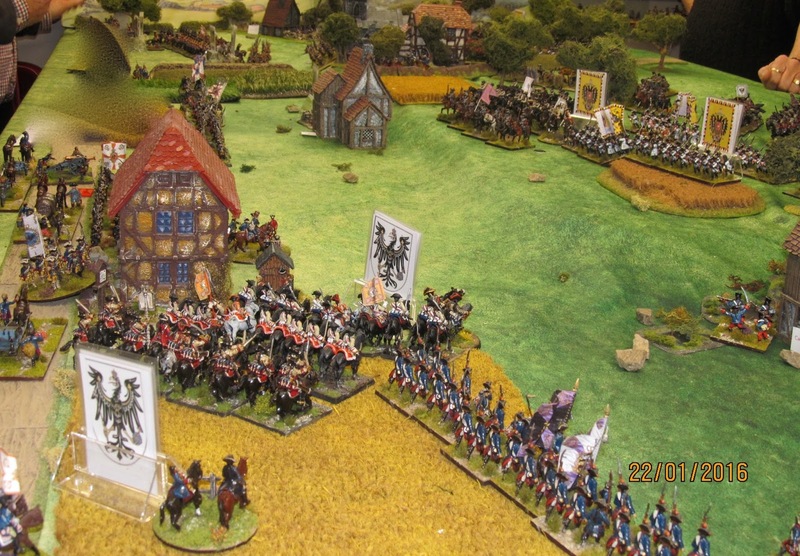 As organiser I thought it best if I took a minor Austrian commander (Feldzugmeister Ernst Dietrich Freiherr Marshall von Burgholzhausen) with the longest name, in order to give me the freedom to control the entry of reinforcements and provide tea, coffee and lunch at the appropriate times. So, Robbie was Marshal Daun the Austrian CinC and Paul was Nadazdy. Graham was volunteered to be Frederick and John played Anhalt-Dessau. I was using my brand new mat from Deep Cut Studios in Lithuania. I have to say it looks excellent, and everyone agreed. 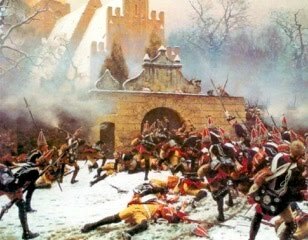 For a detailed account of the battle I can recommend http://www.kronoskaf.com/syw/index.php?title=1757-06-18_-_Battle_of_Kolin . Charles S. Grant also includes Kolin in one of Wargaming in History titles, which I used for ideas in setting up this game. These maps are from Kronoskaf. I made Bevern Dashing +1 to reflect the fact that although his orders were to merely demonstrate against the Austrian left, his troops were stung into a precipitous attack by Croats' nuisance firing. 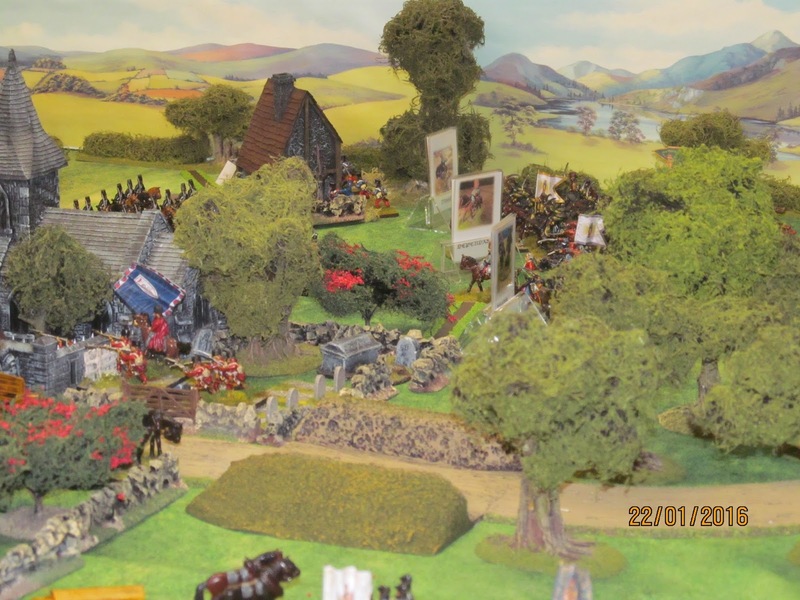 Von Marshall's command was facing Bevern and was not allowed to move until turn 5 or Bevern came closer than 60cm. * means the unit(s) so marked are superior, ** that they are inferior, which is not good for the Austrians saddled with 5 regiments of inferior hussars! Let battle commence! 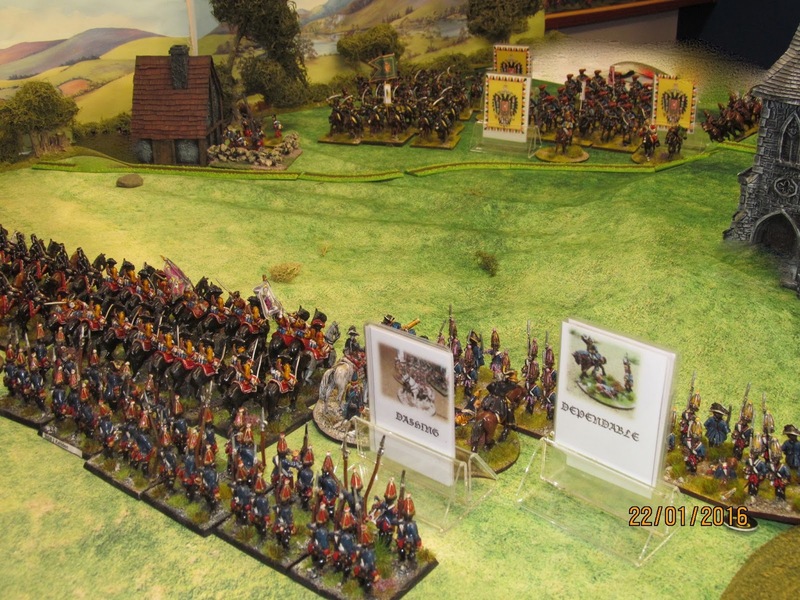 A very distant shot of the extreme eastern end of the table with the Austrian hussars beyond the village of Kreczor, garrisoned by Croats. 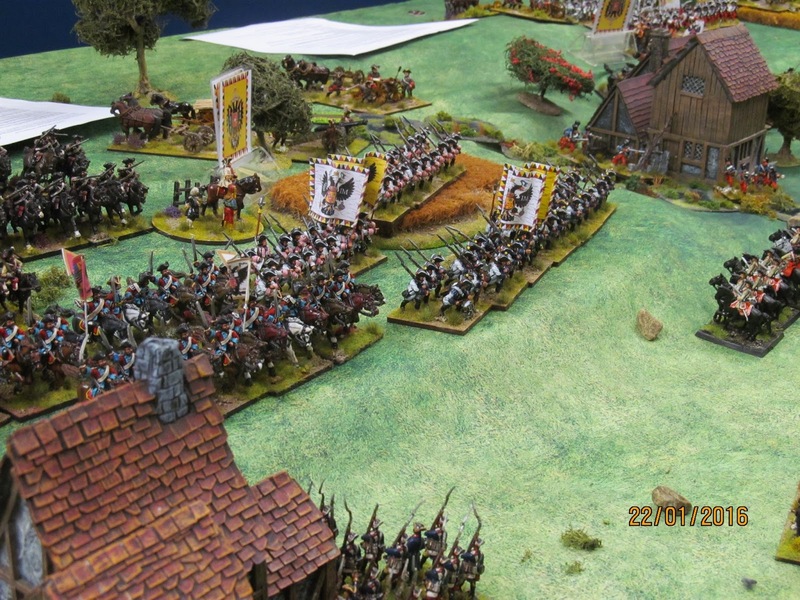 Von Hulsen's command poised to make their assault on the Croats holding Kreczor. 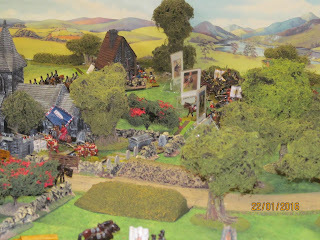 The sunken lane was more of a hindrance than a help to the Prussians. 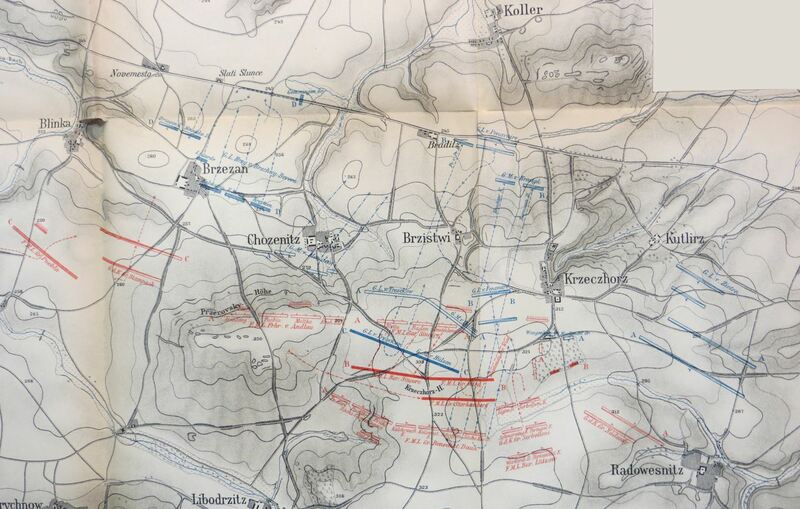 Von Tresckow's command began the game in march column on the road but quickly deployed to face south through the standing crops to face the Austrian positions on the hill. A good view from West to East down the table. 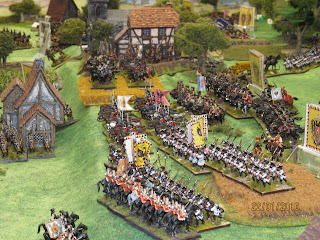 The Austrians on the right have plenty of cavalry but very few active infantry at this stage. 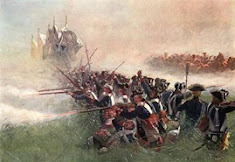 The Croats in the villages were to prove to be more than a slight annoyance for the Prussians. The cavalry both sides clashed on the Eastern end of the battlefield, with the Austrians at first gaining the upper hand as Graham's hussars were weakened by fire from the Croats in Kultire (just out of picture to the left) and Kreczor (with the church). 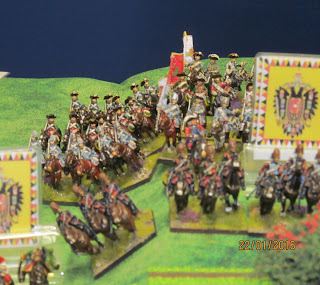 Paul's combined 'elites' regiment broke first one then a second regiment of Prussian hussars. 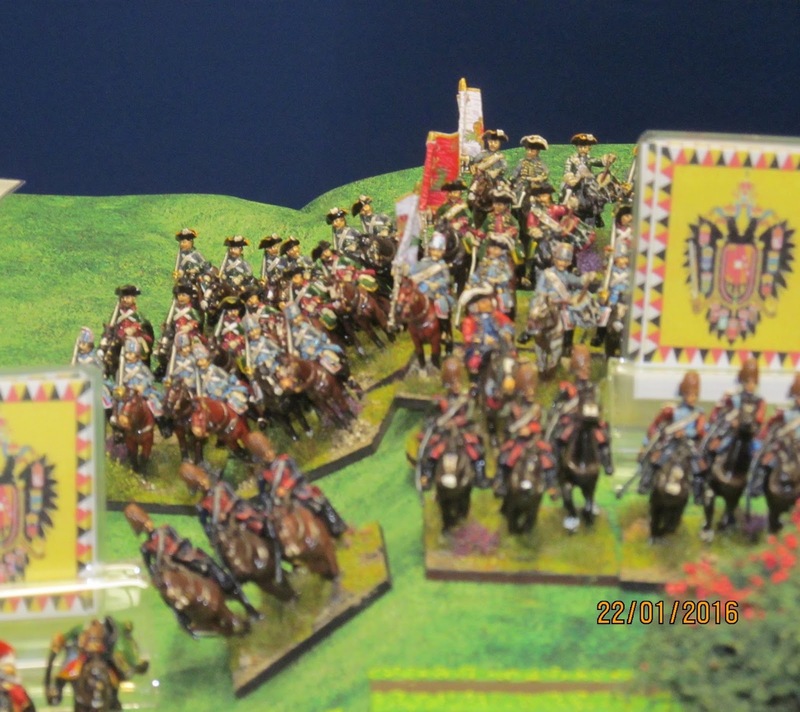 The second unit of Prussian hussars about to break. Von Zeiten looks on in a foul temper. The little stream was very deceptive as I understand it was a real obstacle, small but very steep-sided with boggy ground along its banks, so cavalry took a whole turn to cross. Neither side wanted to give the other the chance of glory! In the centre, Serbolini's cavalry were moved to the front of the hill to threaten the Prussian advance. 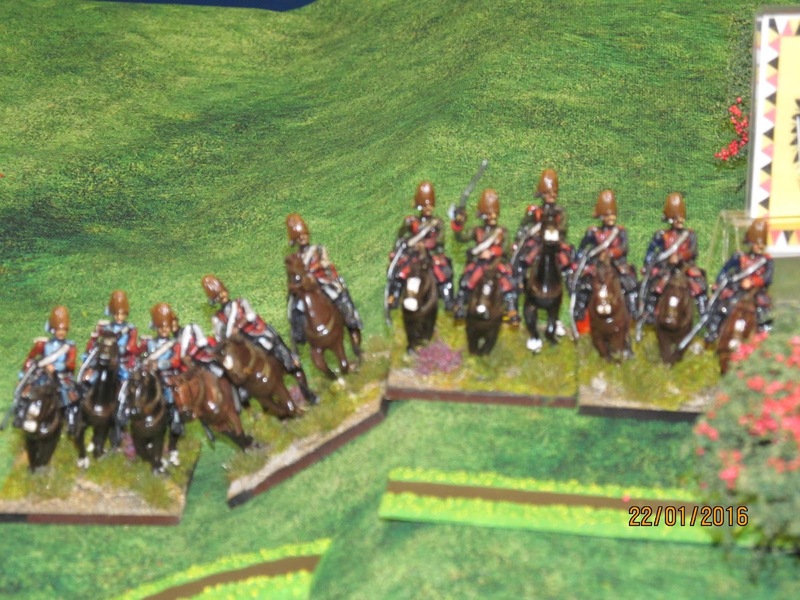 By some strange twist of fate I'd allocated this commander the Jung-Modena Dragoons and the Alt-Modena Cuirassiers. Both represented by my venerable Hinchcliffe models. 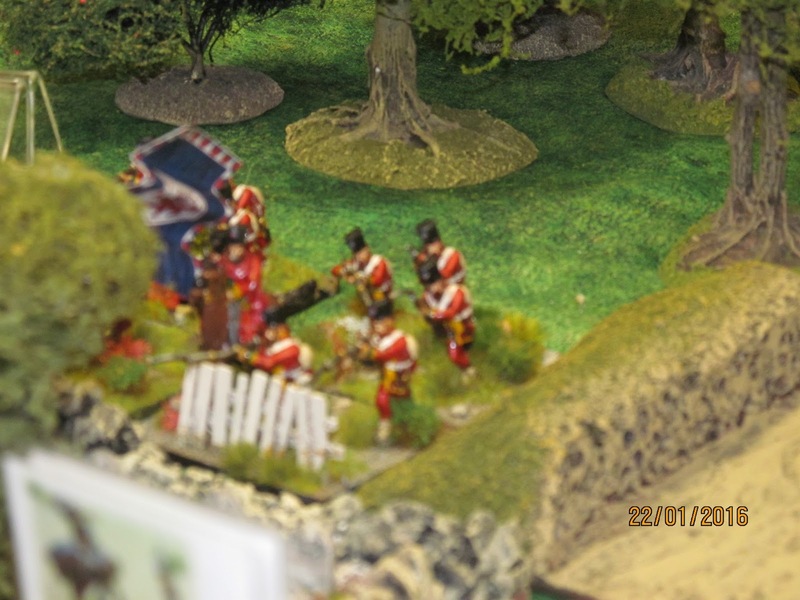 Von Tresckow's infantry in the process of driving the Croats (represented by my Austrian jager) out of Bristwi. 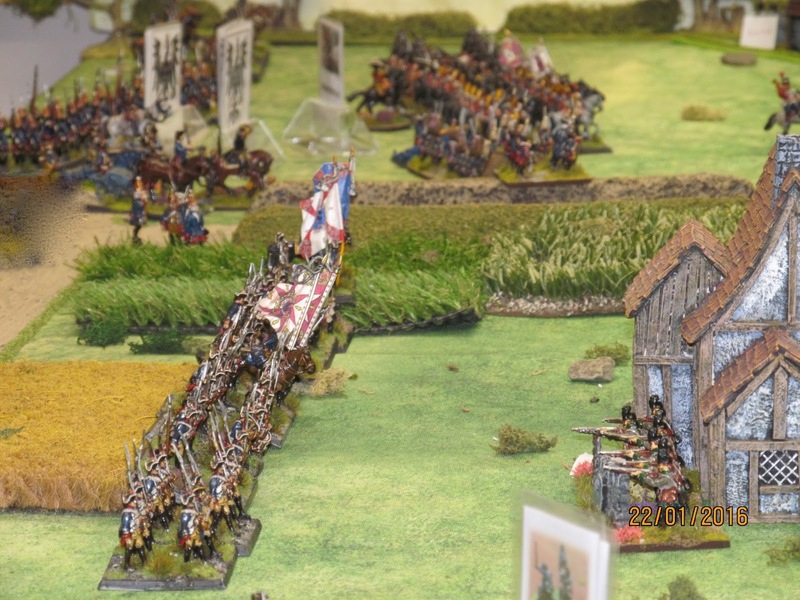 At Kreczor the Prussian artillery had managed to drive out the Croat garrison, seen here vaulting over the graveyard walls to safety! 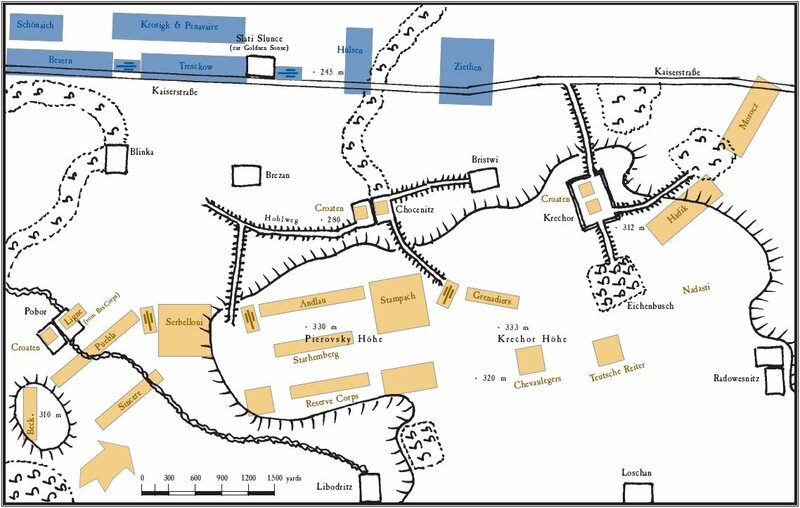 Paul had hoped to get his grenadiers into the village but they seemed rooted to the spot as apparently messenger after messenger failed to get through. 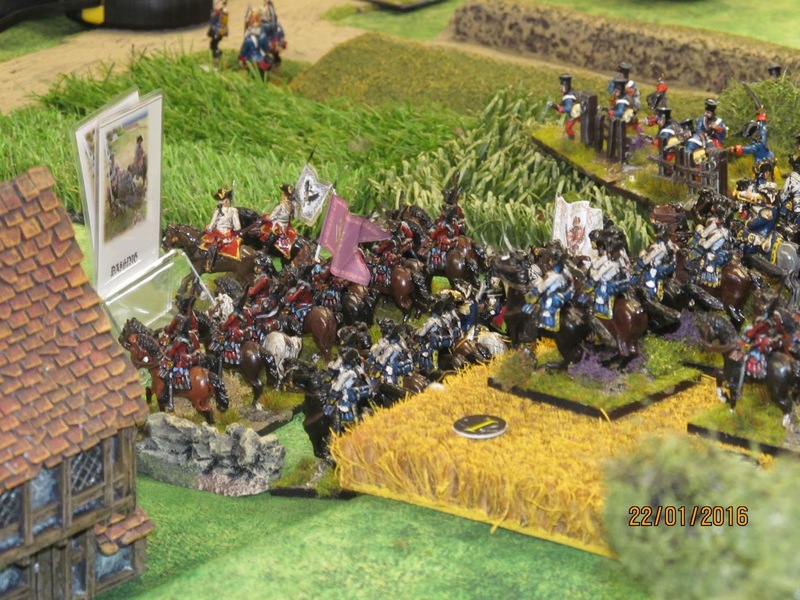 The Prussian left now reinforced by a brigade of cuirassiers and overseen by Frederick in person. 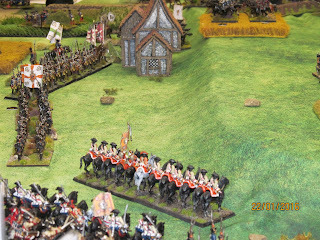 The grenadiers are about to assault Krezcor. 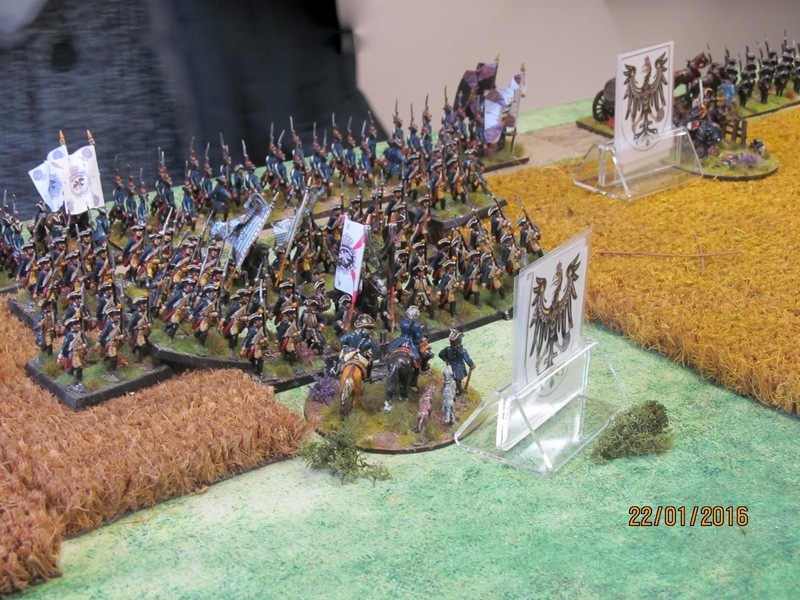 Paul had also reinforced the hussars on the right wing with three regiments of Saxon cheveaulegers, leaving that flank pretty much slowed to a halt for a while. Weid's infantry in the centre and Serbolini's cavalry on the hill facing Pennevaire's Prussian cuirassiers. Severn's infantry can be seen in the corn to the right. 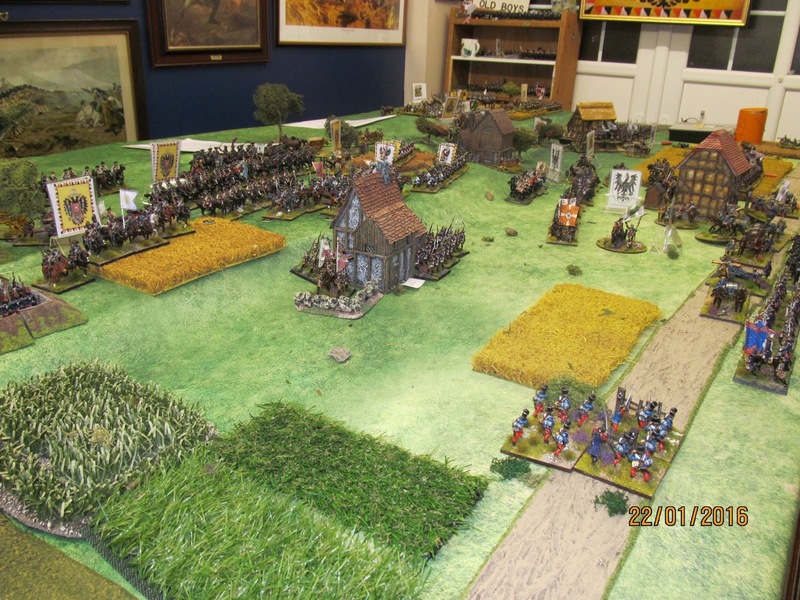 Behind the building (the Sun Inn) is Norman's brigade of dragoons and a rallying battalion von Tresckow's command. 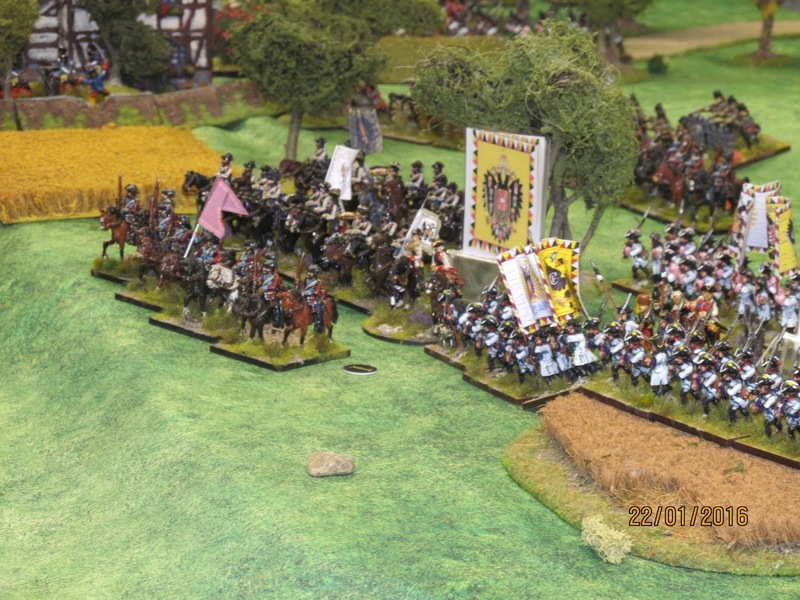 The Austrian cavalry took heavy casualties from the Prussian guns and one regiment was forced to withdraw to rally. The Prussians have occupied Kreczor, driven out the Croats and captured their cannon. They had taken heavy losses and needed to regroup and rally. Frederick can be seen just to left of the church encouraging them from the safety of the 2 foot thick walls! 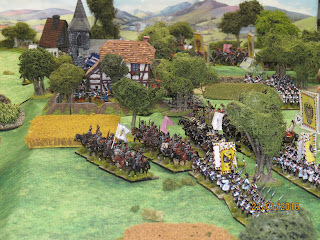 In the area beyond the church of Krezcor the massed Austrian/Saxon cavalry were motionless. 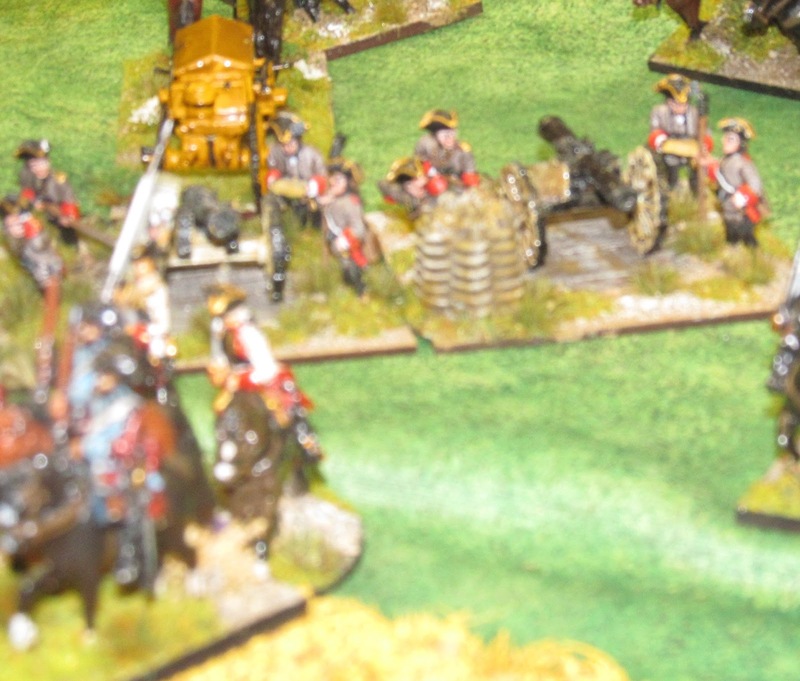 The main Austrian artillery battery caused a fair bit of damage on the Prussians but was masked for a while by Serbolini's horsemen. Nevertheless they found other targets and continued their execution throughout the game (or would have if they'd hit more often). 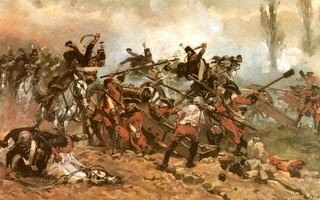 Robbie threw caution to the wind and charged down the hill right into von Norman's dragoons. 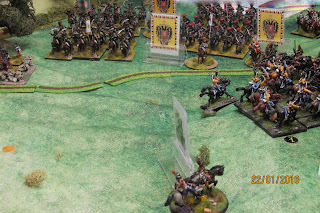 The Prussian cuirassiers now don't have to worry about the Austrian cavalry in the centre, and prepare to charge the Austrian centre. Unfortunately the Prussian infantry were supposed to move up into range to try and wear down the Austrian infantry through musketry before the charge went in but there was a breakdown in communication. Jung-Modena dragoons supported by the Alt-Modena cuirassiers locked in combat with Dragoon Regiment No. 1 von Norman. 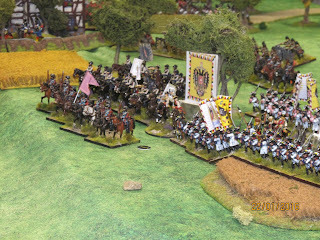 Predictably the leading Prussians were routed but the Austrians were also done for. Remember that big gap left when Serbolini charged to glory? Well, it was quickly filled by the cavalry from von Weid's command, just as John threw a 6. 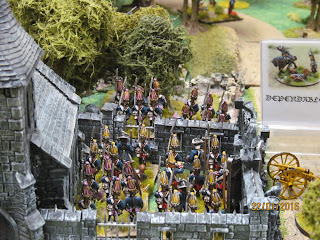 With a 'dashing' commander this meant that as they were close enough they had to charge. 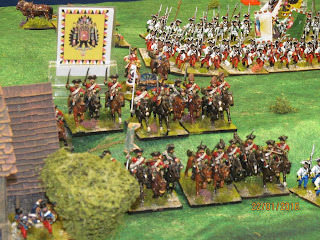 Remarkably the cuirassiers survived the closing fire but were forced back after a brief melee. 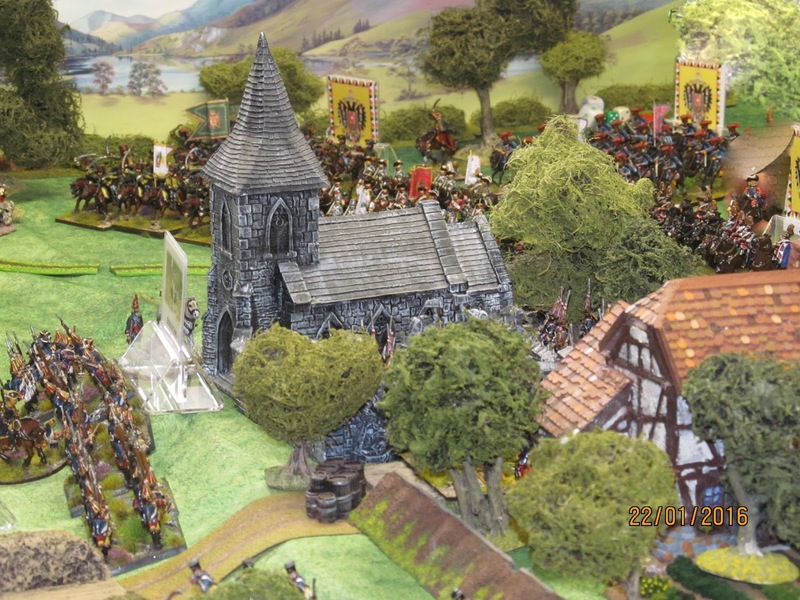 Prussian grenadiers in the churchyard. 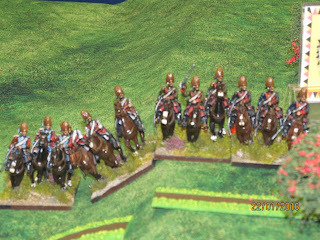 The Austrian combined horse grenadiers regrouping. The former garrison of the church taking pot shots at the new residents. 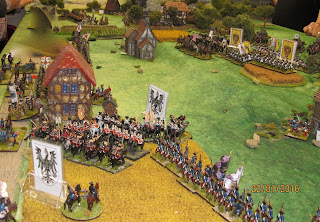 On the far right the Prussians under Bevern had advanced, driving the Croats out of Brezan (the thatched building in the distance) which was occupied by the Prussian Guard. 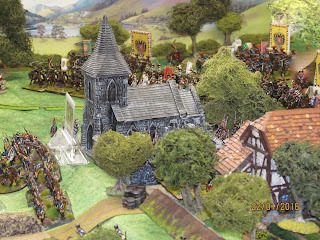 They had obviously seen the print on my wall depicting them being riden over by the Austrian cavalry in the original battle and decided that it was safer in the village. 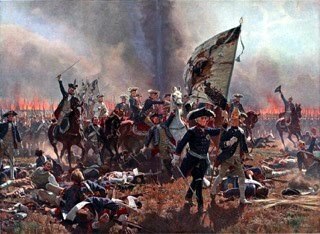 The Austrians counter attacked but were initially driven back before their artillery started to knock men and horses down throughout the Prussian left. Stand off in the centre. 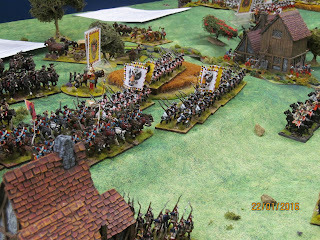 The Austrians were not going to move off the hill and the Prussians didn't have the men to attempt to drive them away. One of the Prussian 12pdr batteries. 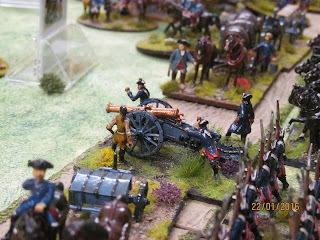 I mainly include this picture to show off Westfalia Miniatures' 12pdr gun. It really looks a brute. The main Austrian battery in the centre. It's performance can only be described as average with occasional signs of brilliance. Austrian dragoons and infantry of Weid's command in the centre. The final positions. In the centre the Austrian CinC can be seen. 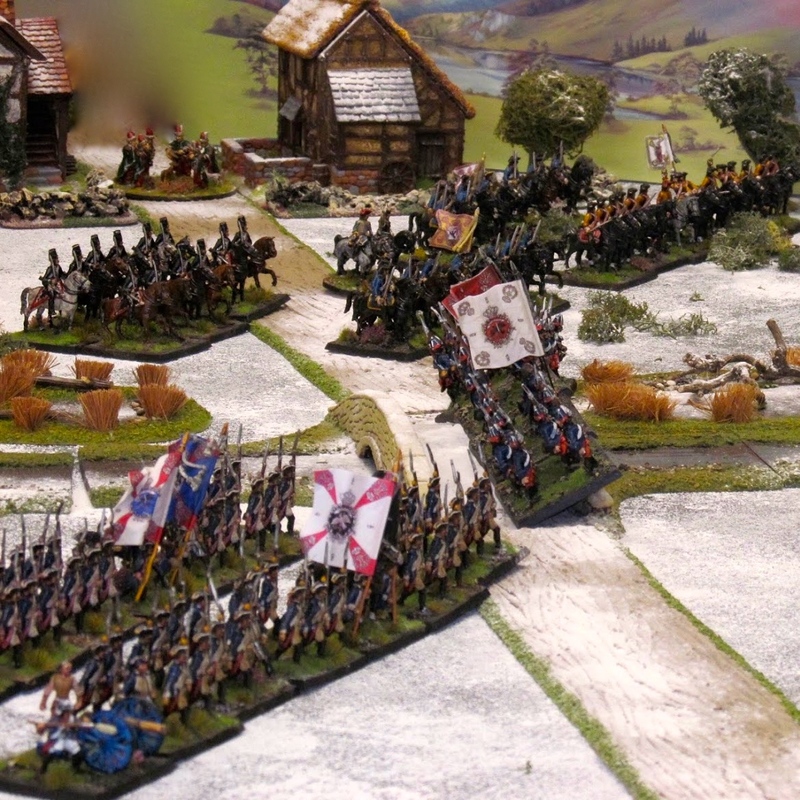 Robbie managed an unparalleled number of failed command rolls, throwing 6 or 7 consecutive 1's when trying to get the Austrian centre to move, thus giving the Prussians time and space to deploy. 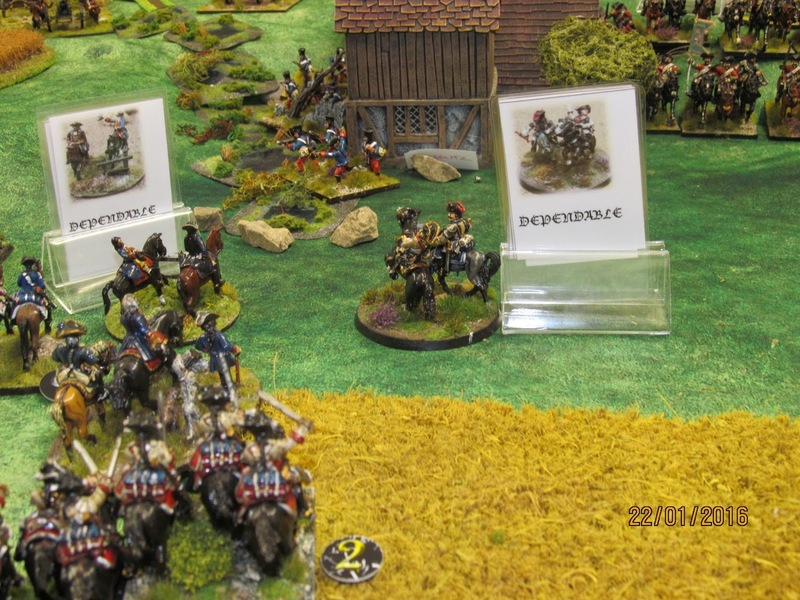 General von Pennevaire (the cuirassier above)was the only commander to become as casualty in the game, TWICE! 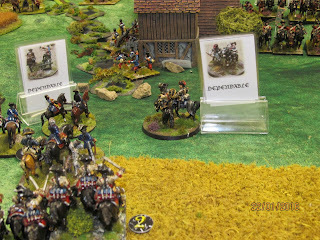 He started the game as a 'dependable' commander but was felled by Austrian fire towards the end of the game. We randomise the ability of replacement commanders rather than applying a straight downgrade as suggested in the rules. On this occasion John threw a 6 and his replacement was classed as 'dashing'. Obviously a rising star on the General's staff. Sadly the next turn, the rising star was snuffed out, and his replacement was 'dependable' again. We had to call it a day at that point, after a game lasting around 5 hours including a brief stop for lunch. With no clear winner or looser it was agreed both sides had fought themselves into a draw. 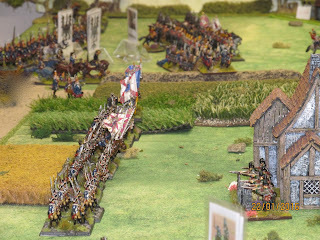 However, under the conventions of the day, the Prussians would have had to abandon the field to the Austrians. 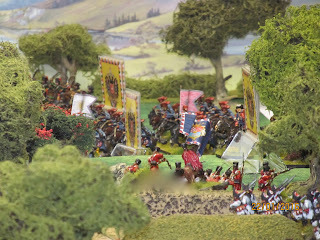 Had we carried on to the bitter end I suspect the outcome would have been an Austrian victory purely because the Prussians would run out of troops, especially in the centre and on their right. 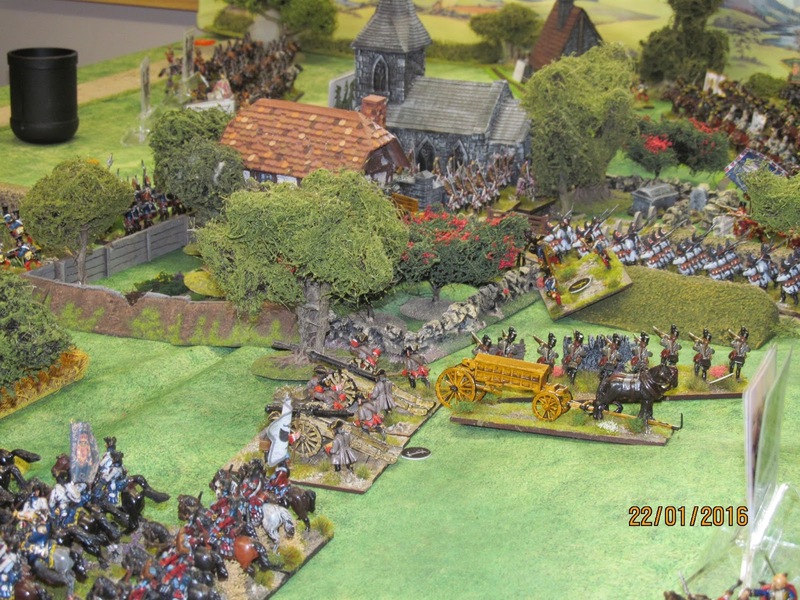 The final lot of Austrian reinforcements might also have helped a bit too. 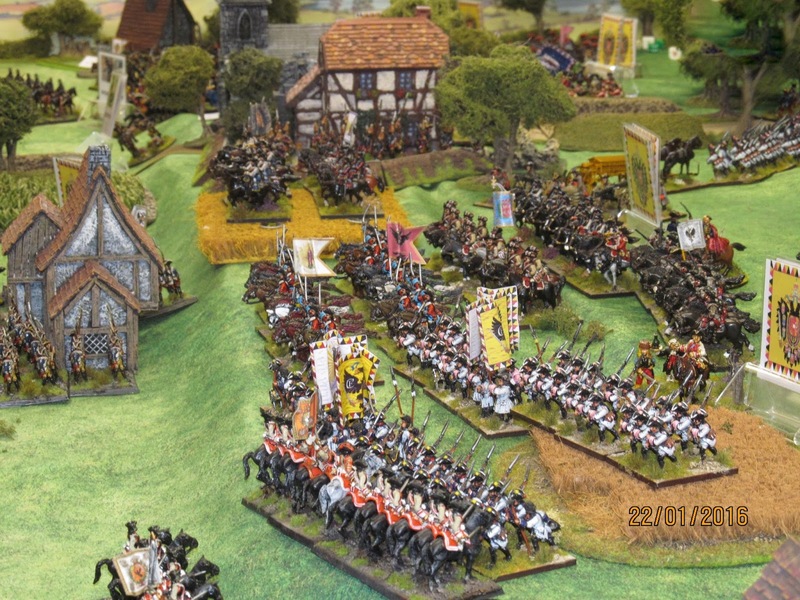 The Prussians actually did better than in the real battle so I will award them 2 points and the Austrians 1 in my 'championship league table'. Everyone seemed to have a great day and enjoyed the game. I certainly did. The rules again worked really well for what was a rather large battle. 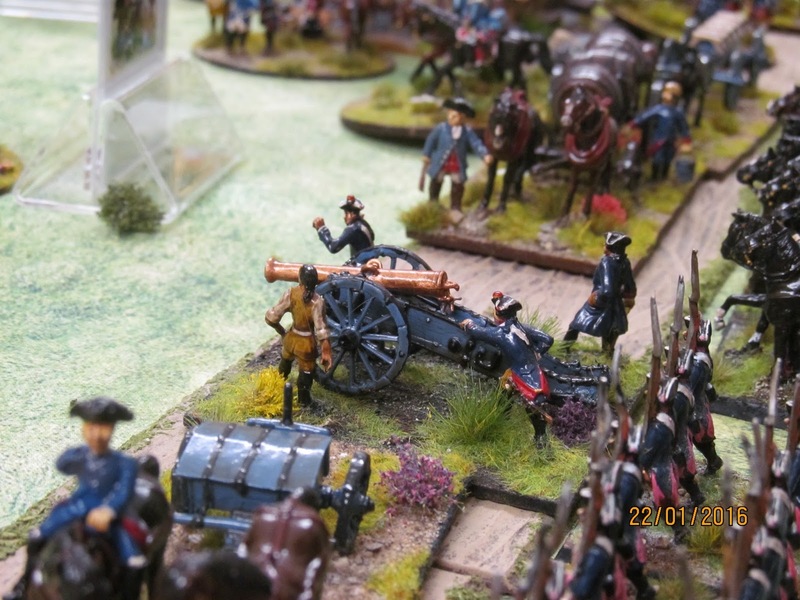 The game and the result was again much more satisfying than when using Black Powder, as the players have to think much more about their troops' stamina and positioning or if they don't will die horribly! Thanks to everyone for making the trek, and I look forward to next time. A word on the little cards if anyone is wondering. In the rules, commanders are either 'Dashing, 'Dependable' or 'Dithering'. In our first couple of games we lost track a little, especially as losses among commanders were quite high in those games. I therefore decided to photograph every commander model I own and create a card for each with their picture on it, showing their ability. These could be switched round as necessary as and when a casualty was caused. That is a cracking looking game and sounds like you all had lots of fun. Nice idea on the cards for the commanders. Thanks Steve. 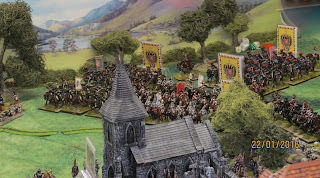 Yes the rules work really well even with larger units and lots of them. About 1500 figs on the table all from my collection, which is scary! Another great looking game Colin, I'm liking the new mat! An outstanding game Colin. Thanks for linking it from the forum. 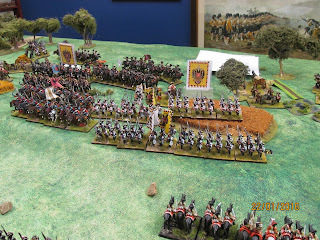 Super report and pics. It looks like it was a belter of a battle. 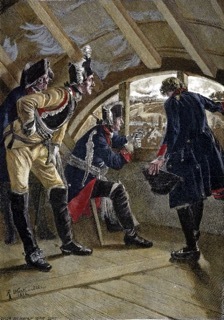 You and I know that the Prussians were let off the hook by the command failures of Daun and Weid. I reluctantly accept responsibility for failing to throw anything but a one for five plus moves. Still it didnt detract from the 'fun?' aspect of the game. Hi Robbie, yes they were and had the dice fallen differently the Prussians would have been hammered. They were already running out of men when we called a halt. Glad you still enjoyed the game. 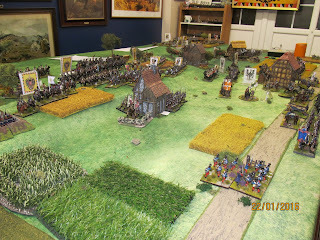 really nice looking table and miniatures. What make of figures are they? I really like them. Super pictures and report, Colin. We are trying the rules here next week, though in a smaller game. As ever, an inspirational visit!